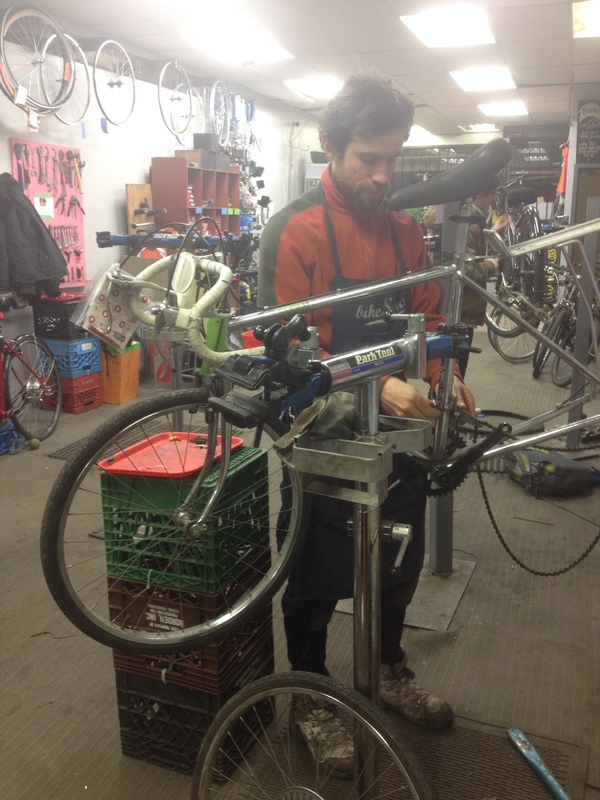 Five years ago, Anibal Davila was repairing bikes with a few friends out of his garage in Kensington Market. When the demand for repairs and DIY fix-it-up space continued to grow, he rented out a space at Queen and Broadview---the parking garage of a defunct funeral home. Davila still tells stories of things he found there: strange chemicals and embalming equipment. Finally, just last year, Davila and the crew of the DIY bike repair shop known as BikeSauce relocated to their "nicest place yet" at 341 Broadview. "We've been always chasing a better space," says Davila. "[To add] more polish to our retail presence." But an evolving location is only one marker of BikeSauce's continued success. At the 2014 Toronto Bike Awards, BikeSauce took home an award for Best Bicycle-Friendly Business. 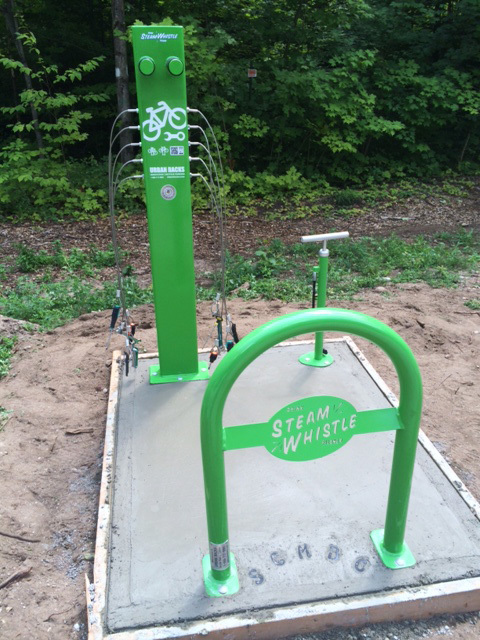 The award came with an impressive prize: a DIY bicycle repair stand courtesy of Steam Whistle. The prize stand has not yet been set up, but will look similar to the one below. "The most immediate benefit [of the new repair stand] is for people who won't come in," says Davila, who expects the stand, which will be set up on the sidewalk out front during business hours, to be used by people who might have language barrier or those who can't make a small donation. "That door is a barrier for some people," he says, gesturing toward the entrance to the shop. While BikeSauce does make some money from the sale of refurbished bikes---often built entirely from recycled scrap parts---they offer repair lessons and assistance at no fixed charge. Instead, customers are asked to make a donation to the volunteer-run shop, taking into consideration how long they were there, how much help they needed and, of course, any parts they used. Davila estimates BikeSauce's volunteer staff at over one hundred, but clarifies that only 30-40 of these volunteers do regular shifts while the other 50-60 are members who come and go as they please. "Part of our mission is to make this a comfortable space where you can hang out," Davila says. "It's a kitchen party most of the time." Physically, BikeSauce matches this description: half shop and half lounge. The place is divided between a row of Park Tool stands, a few couches and a back-corner kitchen where soup is heating on the stove. On weekends, volunteers and guests are offered free lunches, and a yellow sign on the fridge happily declares there's pizza inside. By the couches, three volunteers sort and shelve a mini-library of cycling resources and publications. But the shop's basement is the true haven for bicycle mechanics. It was a shock to me at first---down the stairs and turn a corner then suddenly faced with rows and rows of wall-to-wall bikes. Well, parts of bikes. 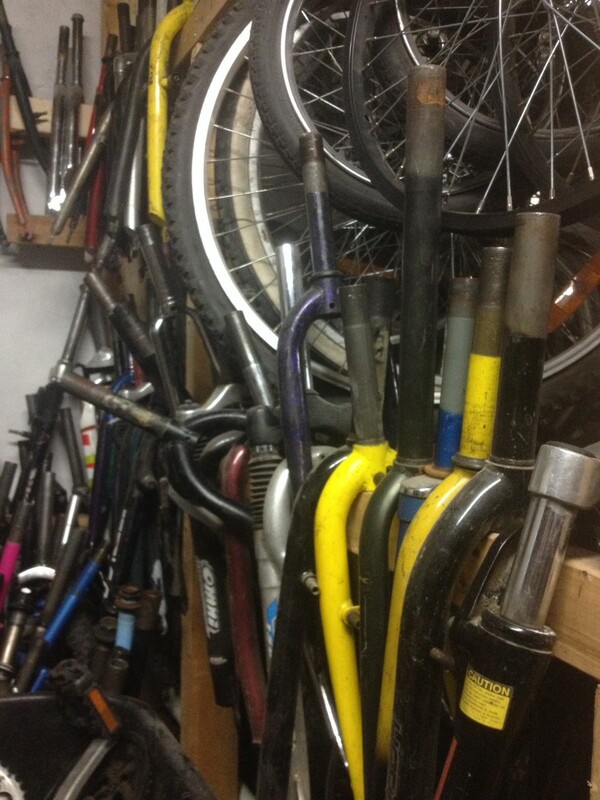 Frames, wheels, tires, pieces here and pieces there---the BikeSauce basement is equal parts graveyard and assembly line. At the far end, where another set of stairs leads back up to the front door, there's "the fleet," a row of working-order reassembled bikes awaiting test rides from volunteers. 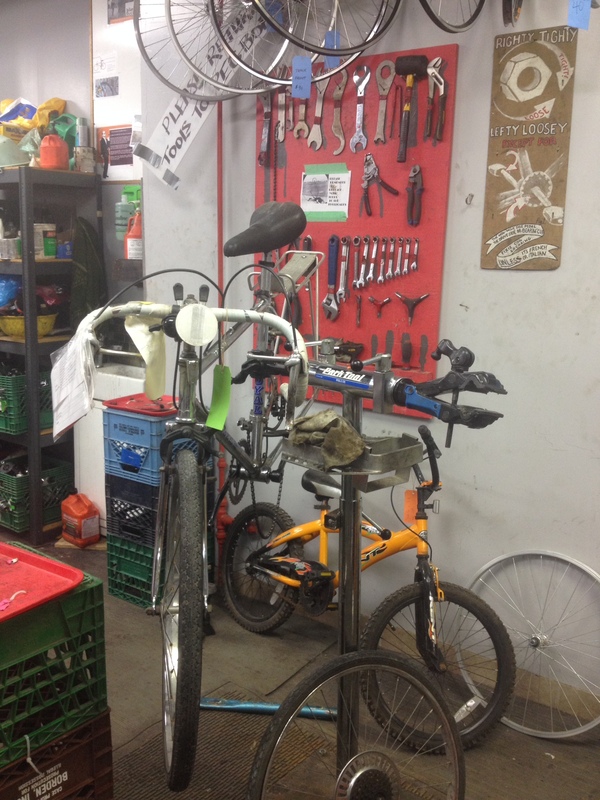 BikeSauce's volunteer staff and members all have day jobs, and they all contribute toward the neighbourhood's most successful DIY shop out of their love for cycling, tinkering and teaching. In fact, the shop's DIY ethos is not just a product of their limited resources, but a preferred method of bike repair. The people who leave BikeSauce do so not only with a better-working ride, but with the knowledge and technical competence to keep it that way. "You're your own best mechanic," Davila says. "No one will ever know it better than you, because you ride it every day." And, for Davila, the benefits of DIY repair are not only practical but emotional as well. "It makes you love your bike more," he says. "You take better care of it." 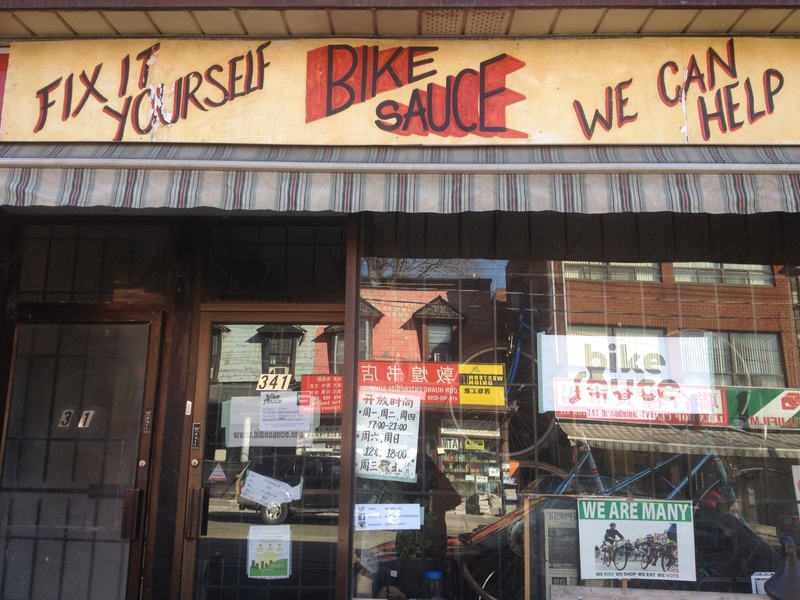 To utilize one of Toronto's most "bike friendly" businesses, and the city's only east-end DIY bike shop (or to use the new DIY stand) check out BikeSauce here or drop in at 341 Broadview Avenue.